Others rode a fine line between the modern digital age and the wild west of yore, holding the horse’s reins in one hand while chatting away on a cell phone with the other. Sometimes the phone rings in the middle of a trail ride! 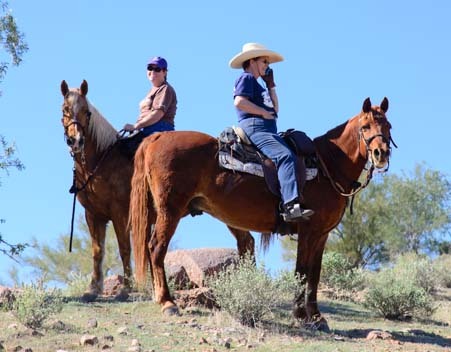 But no matter whether they looked “wild” or “western” up close, once they rode off down the trail and headed into the stands of cactus beneath the red hued cliffs in the distance, these avid equestrians brought the western landscapes to life with the clip-clop of hooves and happy whinnies of their horses. 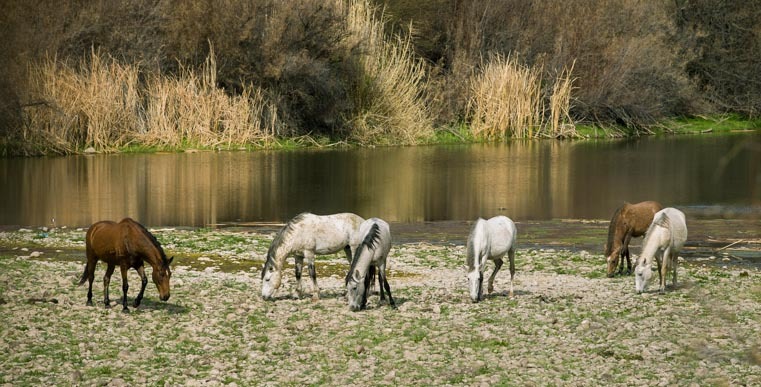 In addition to seeing lots of riders with domestic horses, we had heard rumors of “wild” horses coming down to the Salt River for a drink and wandering around the Tonto National Forest lands between Fountain Hills, Mesa and Apache Junction. We kept running into people who had seen the wild horses “just last night,” or “earlier this morning,” or while out on a drive in their car. Friends of ours who live in the area said they spotted the herd all the time while driving to and from work, sometimes on one side of the road, sometimes on the other. 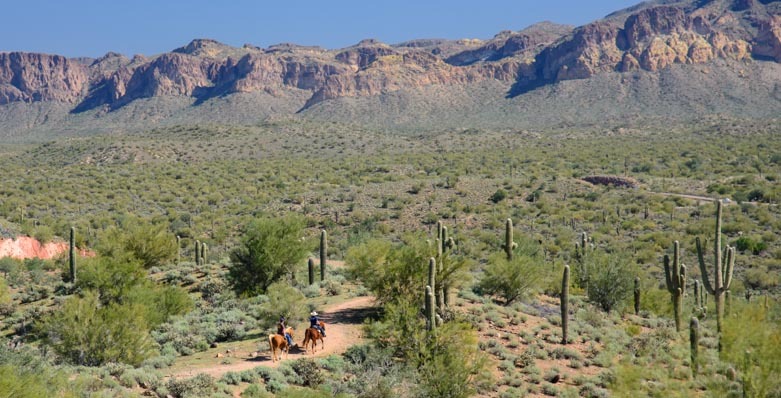 A classic southwestern image: horses and riders on the trail. Everyone was always thrilled when they saw the wild horses. But we didn’t see a thing. We knew our chance would come, but it wasn’t something we could plan for, and it was quite a few weeks before we finally spotted them. One afternoon there was a sudden commotion around us, and I heard Mark yelling, “They’re down there!”. 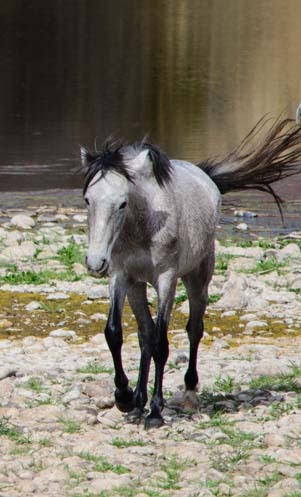 We get our wild horse sighting at last! As if to confirm his announcement, I suddenly heard a whinny in the distance. We grabbed our cameras and flew down to the river banks. 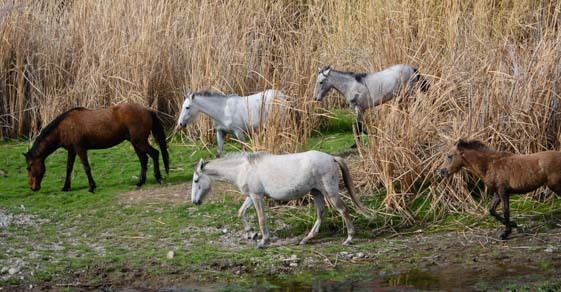 There on the gravelly shore was a small group of horses. The afternoon light plays with the horses by the river. 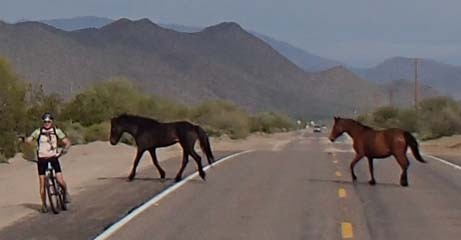 There was something so magical about seeing wild horses roaming free in Arizona. These unusual horses didn’t even have any shoes on! 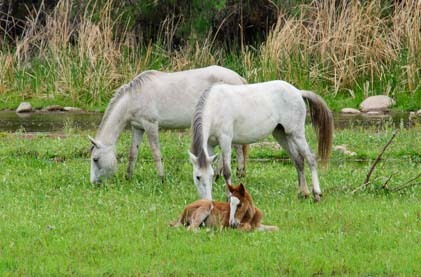 They milled around by the water’s edge, munching casually on the grasses that grew there. The herd walks through the tall grasses to better grazing grounds. They moved slowly, unconcerned by the gaping, grinning people that were pointing at them and whispering to each other about them. Their only concern was the tenderness of the grass and whether it was tastier over here or over there. The group moved slowly from the river’s edge through the tall dry grasses, and one by one they disappeared and reappeared between the reeds. These horses are pretty relaxed! Suddenly two of them flung themselves to the ground and then rolled over on their backs, legs pawing at the air as they scratched their backs on the gravel. Then they rolled over and bounded back to their feet, shaking their manes and their tales vigorously. Such freedom — and such blasé nonchalance! 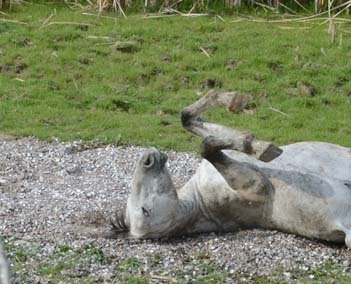 Ahhh… There’s nothing like a good back scratch! A few moments later they were gone, vanishing into the reeds to find other places to forage. We were overjoyed to have had so many minutes with them by the water’s edge. We had gotten our wild horse encounter just as we’d hoped. We didn’t expect to see them again, because they are continually on the move and their range is quite large. Horses cross the highway near us during a bike ride. A few days later, however, while we were out on our bikes, we suddenly heard the familiar whinnies and then spotted them crossing the road. They sauntered across the highway as if they owned the place. We were thrilled. Such great fortune to have TWO wild horse encounters. But the best was yet to come… One afternoon we heard the whinnying again, and we ran down the trail. 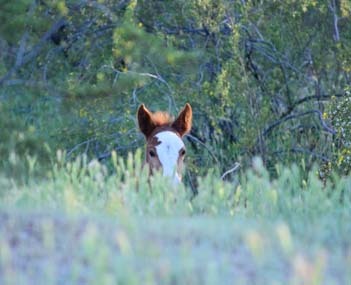 A little colt peeks up out of the grass at me. The people coming up the trail were smiling from ear to ear, cameras still in their hands as they talked excitedly about what they’d seen. I flew as fast as my legs would carry me. And then I skidded to a stop when I looked up and saw a little face peeking at me over the grass. 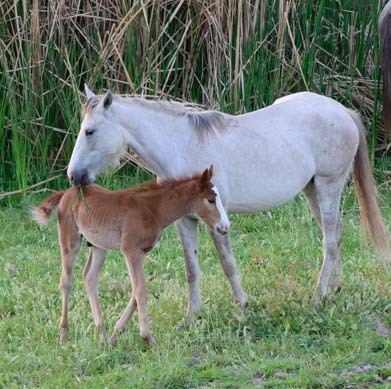 It was a little foal. He tip-toed out into a clearing, curious but not wanting to stray too far from mom. He stopped and stared at me. He had the longest legs and littlest body imagineable, and he had a sweet little white cowlick in the middle of his forehead. 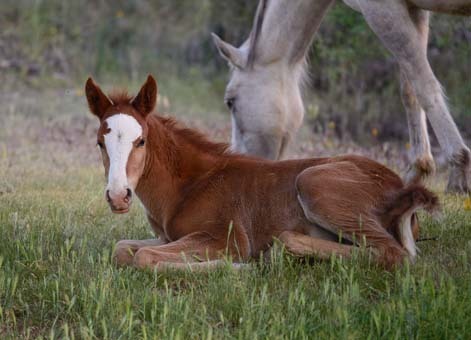 The colt takes a break and lies down in the grass. He stared at me for a long time, just watching. His mom was busy eating, and only the flick of her ears in my direction showed that she had any concern about me. I watched this little guy for ages as he tip-toed around the grass. Eventually he got tired. He folded his legs under him and laid down. Mom didn’t mind. She just kept on eating. Another horse came over, nibbling as he walked. I don’t know if he was the dad or not, but the three of them made a wonderful family portrait. 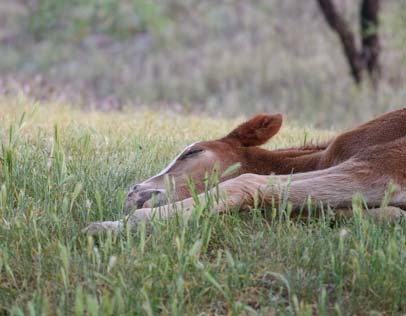 The little colt got drowsy and quietly laid his head down in the grass to close his eyes for a bit and catch a quick snooze. Mom still didn’t mind, and she wandered away from him for a moment to sample some grasses under a tree. When she wandered back, she nuzzled him for a second. I’d seen him sampling some grass and rolling it over and over in his soft lips, but I don’t think he was really on a solid food diet just yet. Mom leaned close to him, and he found the nourishment he was looking for. Grass is good, but this is better! Once he had had his fill, he stepped back and stared into the distance contentedly. Mom moved along and he followed, stepping gingerly through the mud. She walked around him and gave him a quick nuzzle. Wow! This wasn’t just a wild horse sighting, this was a real encounter, up close and personal. I was now standing in among them and could almost touch them! 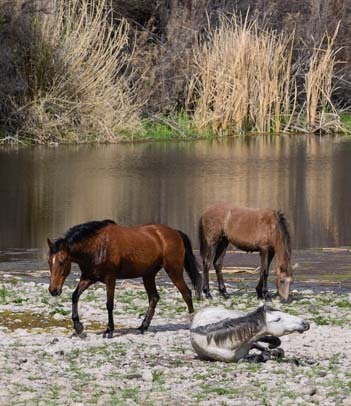 When I got back to our trailer, I started looking up whatever information I could find about the Salt River’s wild horses. It turns out there is a lot of debate about what to do with them. 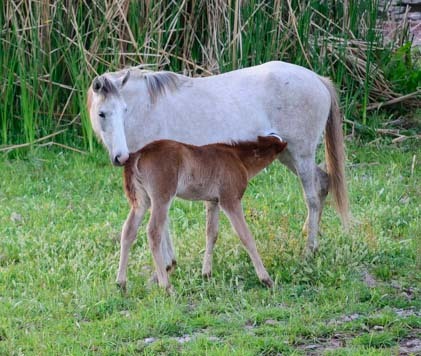 Their ancestors likely came from the Indian reservations in the surrounding area, making them multi-generational descendants of feral horses that either escaped or were turned lose decades ago. Are they wild? Are they feral? That distinction makes a huge difference. In other parts of the west, wild burros are protected and monitored by the Bureau of Land Management, and there is an active “Adopt-a-burro” program where people can volunteer to care for the burros on their own properties. 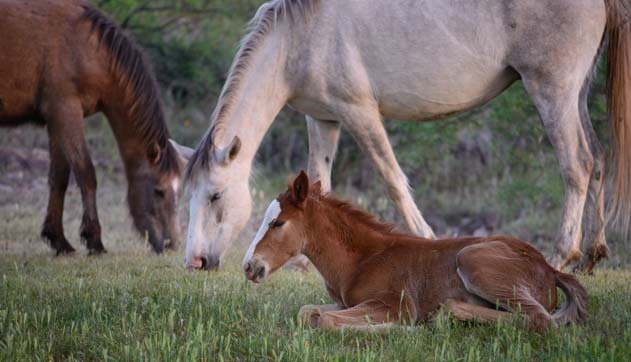 However, because these horses aren’t legally classified as “wild,” they can’t be protected by any kind of wild horse program. Yet they aren’t “domestic” animals either. 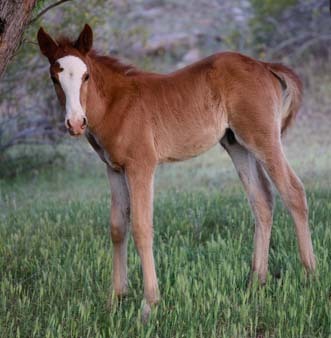 So they have fallen outside the legal definitions that would give them the same kind of legal clout as officially “wild” and “domestic” horses enjoy. 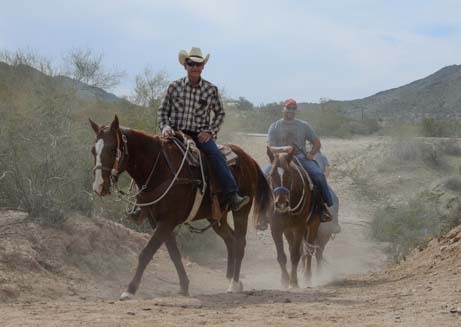 They don’t have any predators, and they aren’t really bothering anyone, but their numbers are slowly increasing, causing a lot of head-scratching for the Tonto National Forest authorities who oversee the lands on which they are currently choosing to live. Auction them off? Cull the herd? Leave them be? All kinds of things have been proposed. Luckily, it doesn’t seem that anything too drastic has been done yet. 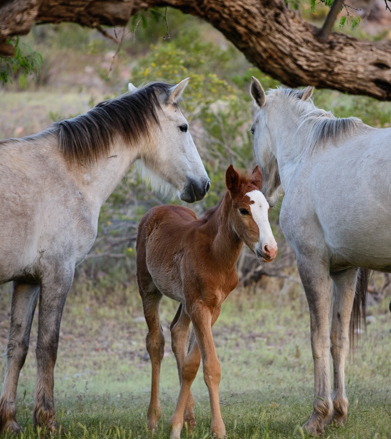 The horses have lots of eager supporters and fans who share info about sightings and behaviors, and the National Forest is often too overwhelmed with fighting fires to fuss with a bunch of horses. 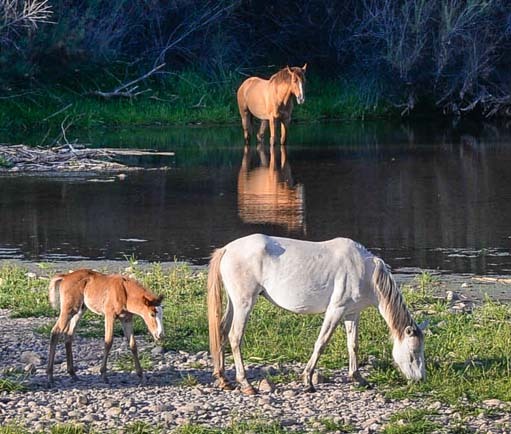 “Wild” horses down by the Salt River. So the herd continues to roam free, to the delight of lots of folks like us who are exhilarated when they are lucky enough to get a glimpse of them moving across the desert landscapes. I have no idea what the right answer is for any feral animal, but the touching moments we witnessed between mother and baby spoke poignantly of the gentle nurturing that is at the heart of all species as we strive for our own survival and try to give our best to the next generation. These beautiful moments in the “wilds” of Phoenix capped off our wonderful winter stay there. Temperatures were heating up and it was time for us to hitch up our trailer and head north. Update: The US Forest Service planned to round up the herd on August 7, 2015, and remove them from the area. Due to lots of work by activists, the herd removal plan was dropped in mid-October, 2015. 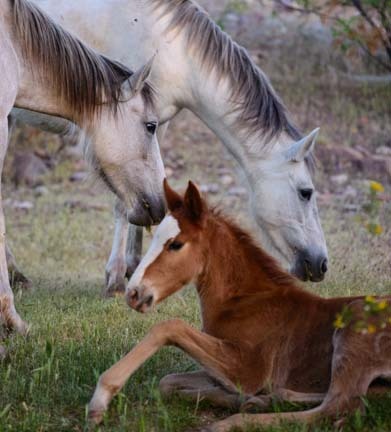 The topic of wild horses on public land is extremely contentious. 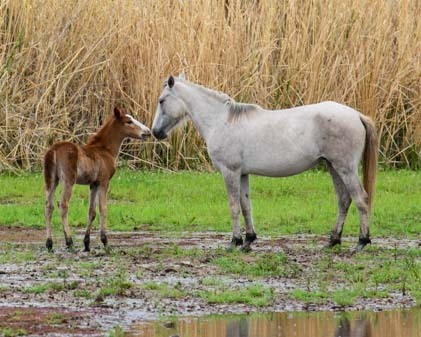 In July 2018 the BLM planned to round up the wild horses in Oregon and sterilize the mares, causing much controversy. 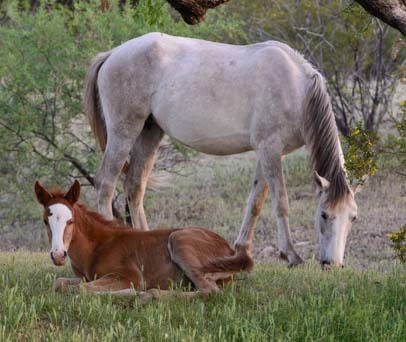 This entry was posted in Arizona and tagged Arizona, Arizona Animals, Arizona Central, Arizona Phoenix East, Birds and Wildlife, New, Travel, USA, Wild Horses, Wildlife, WP Travel by Roads Less Traveled. Bookmark the permalink.